This Saturday, 10 November, is 2018’s Equal Pay Day in the UK. After this date, women will effectively work for free until the end of the year because of the gender pay gap. It is 100 years since some British women first got the vote under the Representation of the People Act, so seems an ideal opportunity to celebrate a woman who played a vital, yet unsung, role in Parliamentary history. 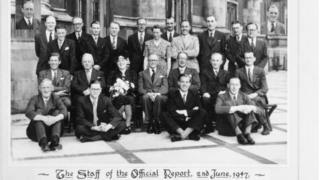 Jean Winder became a trailblazer in January 1944, as the first woman to become a permanent Hansard reporter – accurately and promptly reporting the proceedings of Parliament and its committees. Wartime labour shortages had forced a change in recruitment practice and Hansard editor at the time, Percy Cole, said “the only reason why I thought of appointing a woman was that I was unable to find a man”. During his time as prime minister, Winston Churchill said Mrs Winder was “a shorthand writer’s dream”, and Mr Cole described her as “as good as the men”, noting that she was commended for her work more than any other member of staff. Records suggest that on one occasion, Mrs Winder reported on a committee at 10:30 through until the House of Commons adjourned at 02:30 the next day, having to sleep in the House. Mrs Winder was also a determined and ultimately successful campaigner for equal pay. She sought justice in 1951 after finding her salary was £250 a year less than some of her male counterparts, and wrote directly to the then Chancellor, Hugh Gaitskell, to ask the reason. It is believed her call for equal pay was encouraged by Conservative MP Thelma Cazalet-Keir’s amendment to the Education Bill in 1944 in support of equal pay for teachers. The amendment initially passed with a majority of only one vote, and was the wartime coalition’s only defeat. Mr Gaitskell’s response to her dodged the question, stating “practically every department has grades where women receive the same rates of pay as men”. He added “this is quite different from the statement that in every government department, where women perform the same work as men, they receive the same salary”. Her call for equal pay came at a time, after World War Two, when this was a hot topic because women had undertaken work vital to the war effort. Her pay claim was supported by Mr Cole and the Speaker of the House, Douglas Clifton-Brown, but calls for her to receive the same pay as her male counterparts became more prominent after female Conservative MP Irene Ward took up her case. Ms Ward pursued it with unflagging energy. On 2 August 1951 she stood up in the Commons to inform fellow MPs of the situation, stating that Parliament “cannot be run on the basis of equal pay” if one woman on the Hansard staff was not paid an equal wage. In January 1954, Mrs Winder finally received the same salary as her male colleagues, and it was agreed her pay would rise along with theirs in future. Mrs Winder paved the way towards the 50:50 gender ratio split in the Hansard team today and, in 2005, Commons Hansard appointed its first female editor, Lorraine Sutherland. From Monday 12 November, the House of Commons library will host a month-long exhibition to commemorate the life and achievements of Mrs Winder, who died in 2005, aged 96. Hansard sub-editor Portia Dadley, who organised the exhibition, said “she was a woman who would not take no for an answer”. “As we mark Equal Pay Day 2018 – and as one of Mrs Winder’s female successors in the Hansard team – I am delighted to be organising this exhibition to commemorate someone who made the words ‘equal pay for equal work’ a reality,” she said. Will the election rosettes be ready in time?